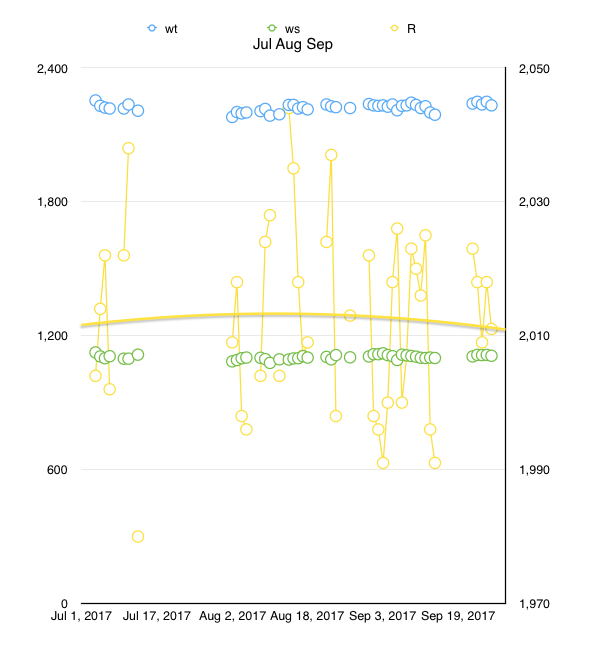 Since I began my health tracking grids I had been regularly tracking my weight, building the habit of stepping on the scale every day. I’ve read several opinions that this is a bad idea. Because one’s weight can fluctuate significantly day-to-day, daily weighing can lead to “fear of the scale” and stress. I disagree. After stepping on the scale every day for about 10 years, it is now simply something I do. The scale shows me a number and I write it down. One day I started reading more about physiology. How your body composition changes. How a strength building session increases muscle mass (duh) and that can make your weight increase in the short term. Suddenly, the scale going up can be a good thing. …and then I wondered, “how much should I optimally weigh?” At the time I began this “waist/weight ratio project,” I weighed about 230 pounds and the “male, 5 feet 11 inches tall” medical guideline is . . . 175 pounds. What?! I would be ecstatic if I weighted 220. I’m not sure what I would do if I weighed even 215— I’d probably fall down in a stiff breeze. One day, I read the following article. It’s deceptively short, but quite complicated and subtle. You should go read this very carefully before continuing.